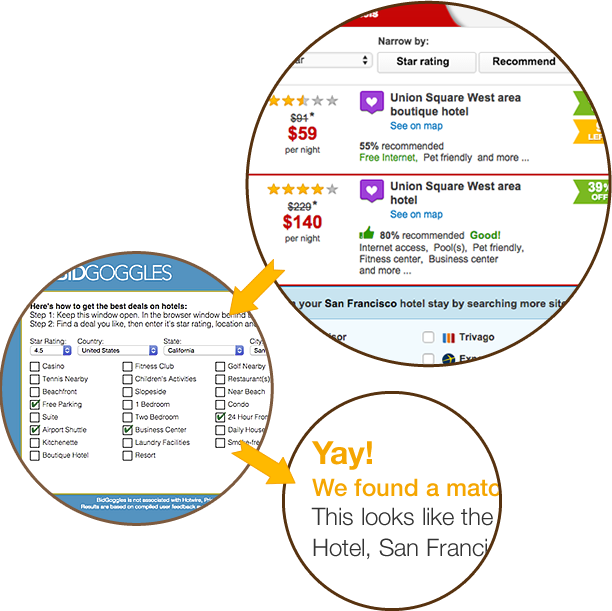 BidGoggles | We're like x-ray vision for travel booking. Don't leave your hotel up to chance. We're like x-ray bidding for travel sites. "My fave tool is Bid Goggles..."
The deals that Hotwire and Priceline give out can be huge, but sometimes booking a room in a complete 'mystery' hotel can be unnerving. BidGoggles is a totally free tool that helps remove some of that mystery. Using info gathered from people who've recently booked, we've carefully constructed a profile of each hotel property and built a super simple tool to cross-reference that data. Visit Hotwire and search for a great hotel deal. With your Hotwire Window still open, enter the mystery hotel's amenities, star rating and location into the BidGoggles tool so that amenities are highlighted in green. Submit and let us identify the matches. That's it! Please note: we're not perfect. Hotel amenities do change and new hotels pop up. Sometimes its not possible identify exactly which hotel you'll be in simply because multiple hotels in that sub-area have the same amenities, but we'll definitely do our best to provide a tool to help narrow it down. The best thing about Hotwire is that the rates are so good, you really can't go wrong no matter where you end up. Enjoy your travels! !